In November, Amir and his StanceWorks-sponsored M3 took to the track at Super Lap Battle, taking home 2nd place in the Enthusiast class. It was a bitter-sweet finish, just 0.02 seconds behind the leading car - yet we did well considering the odds against us. The season came to a close shortly after; the final race took place at AAA Speedway, where Amir and the M3 took home a first-place finish, leaving our spirits high for the incoming 2014 series of events. Our successes would have been impossible without Amir's talent for driving, but equally impossible without the time, effort, and help that went into the build that lead us to victory. The weeks leading up to Super Lap Battle were spent at Avus Autosport, where Amir would pull long nights prepping every aspect of the car. Due to different class regulations between the Redline Time Attack and Global Time Attack series, one of the items that fell on the list of necessary changes was aero. A front splitter was built, and an APR wing was borrowed, which covered the bases. 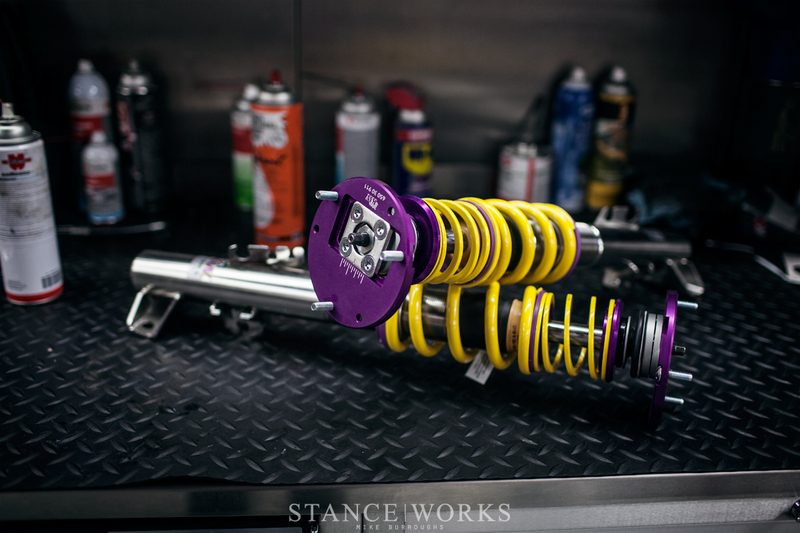 However, it was suspension that headlined the to-do list, so we tackled it with the help of VAC Motorsports and KW Suspensions. While it's my job to help in any way I can, Amir is the one who has to make the calls as to how to build the car. 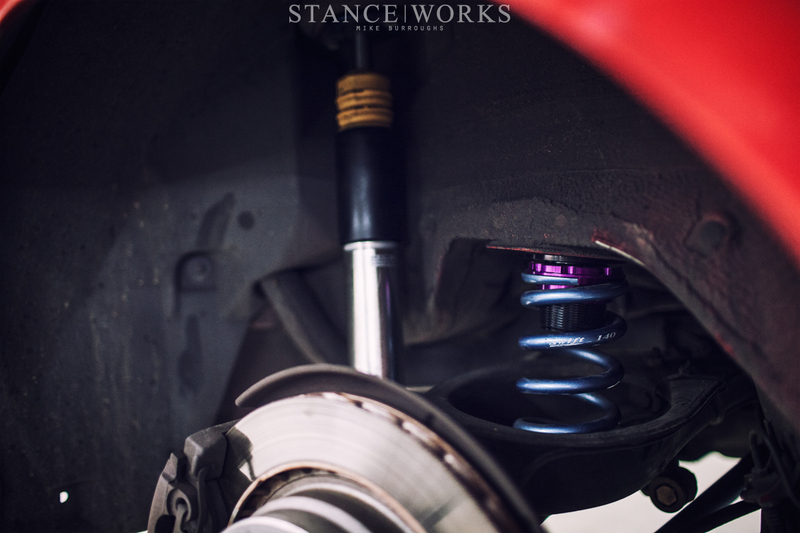 "One of the biggest factors when setting up a car is having a suspension that can manage bumps on the track surface, change direction quickly, and have a large range of adjustment to suit different tracks and conditions. 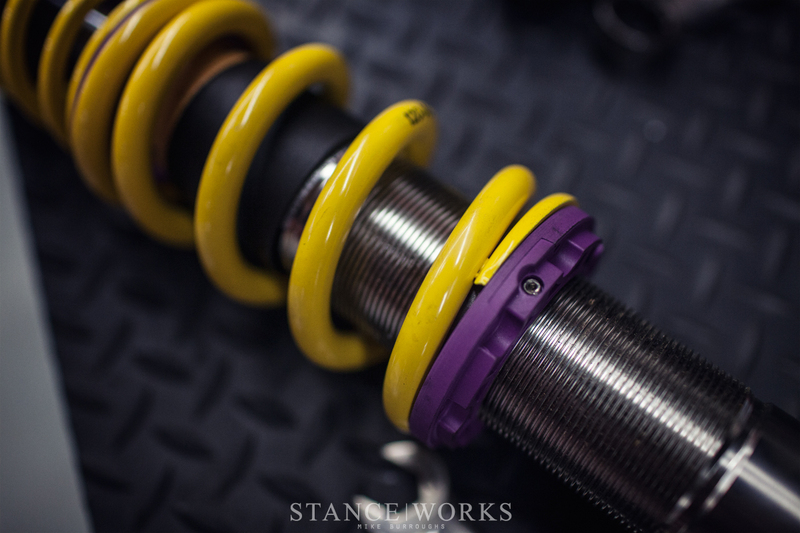 Most suspension set ups are a compromise that can do one or two of those things well." In comparison, KW presents a high-quality alternative that does all of this, and more. The KW Clubsports were Amir's go-to, since they are an option that not only maximizes performance on track, but also provides an excellent ride quality on the street - important in a car that sees both track and daily driver duties for the Enthusiast Class. 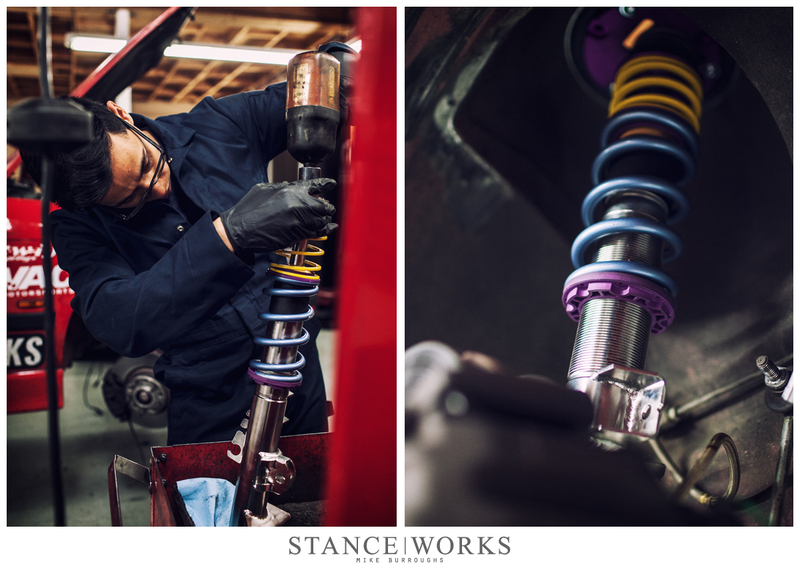 There was only one needed change to the new coilover setup: our friends at Swift Springs supplied the springs which were used on Amir's previous set of TC Klines. Amir has spent time fine-tuning his spring rates, so, despite their quality, he opted to removed KW's springs in exchange for the Swifts. Amir set everything to a rough-guess height, as later, the car would be re-aligned and corner-weighted. After our test-mount of the front struts, we removed them to make one final change - the front strut tower reinforcement plates had to be cut and notched to allow access to the camber plates' adjustment bolts. While the notching isn't necessary on your average street car, Amir insisted on immediate track-side access to adjustability. Once each side was cleaned up, the front assemblies were re-stacked and mounted into place. 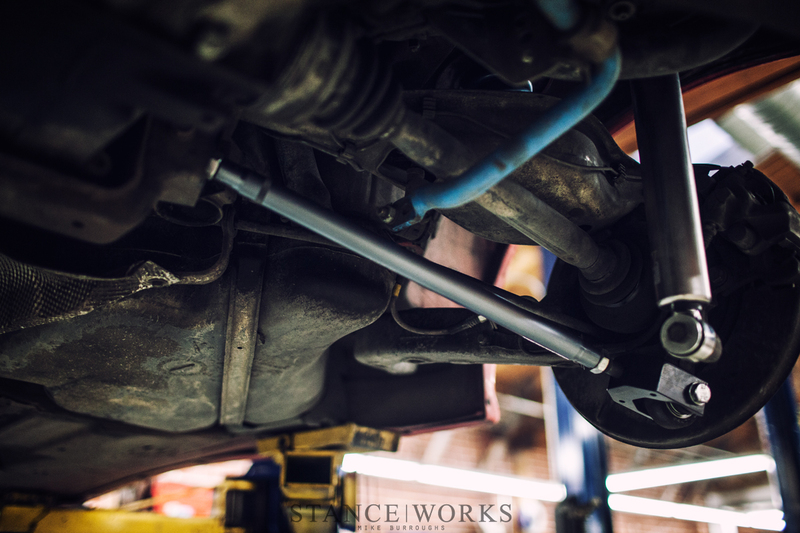 The KW-suppplied swaybar end links were swapped in, and with that, the front suspension was complete. While the E36 is very simple to work on, the front end, in comparison to the rear, is a good bit more time consuming. The rear struts were dropped, which freed the springs. 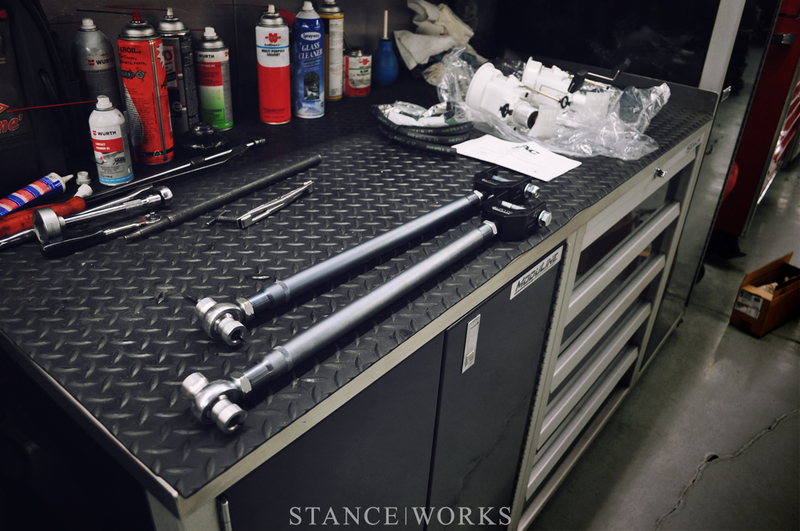 The KW adjusters were swapped in to place, and the KW rear struts installed. Within minutes the rear was taken care of. The bigger project at the tail end of the car was the replacement of the lower control arms. For the parts, we went to our friends at VAC Motorsports. The stock lower control arms on the e36 don't offer much camber adjustment. 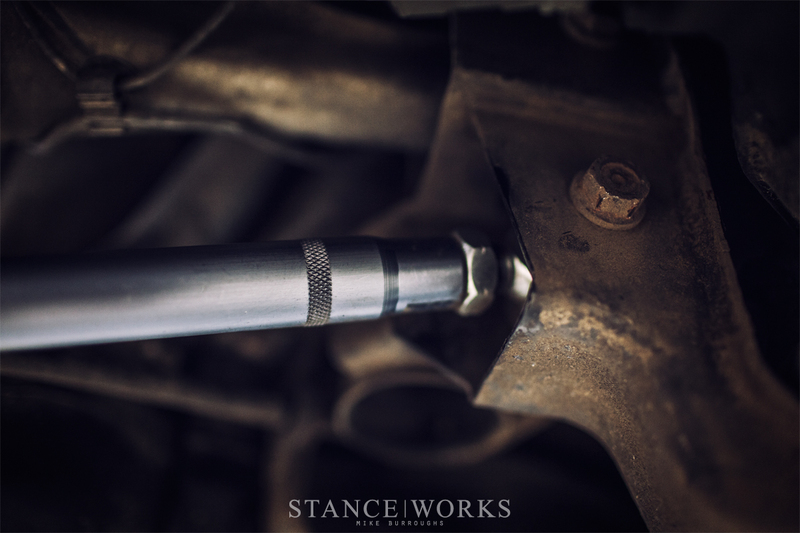 On top of that, stock arms have rubber bushings which deflect under load, making the alignment inconsistent during cornering. 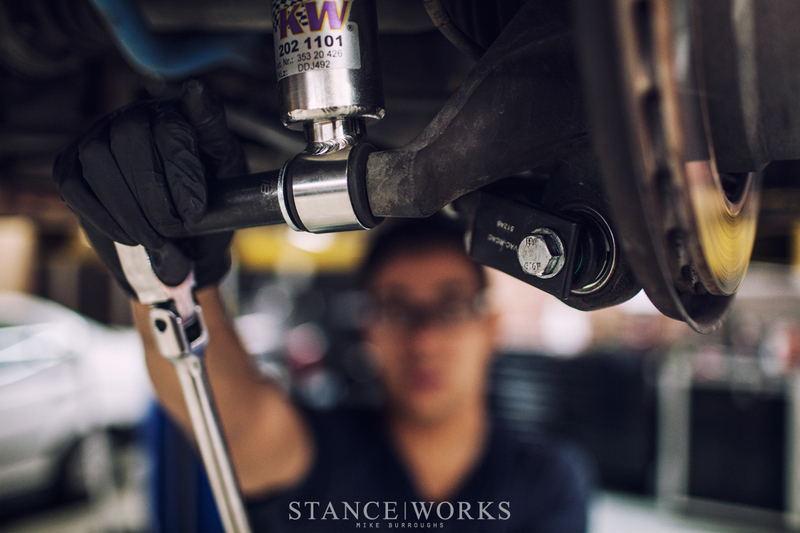 The VAC control arms provide a wide range of adjustment and make changing the rear camber easy and precise. 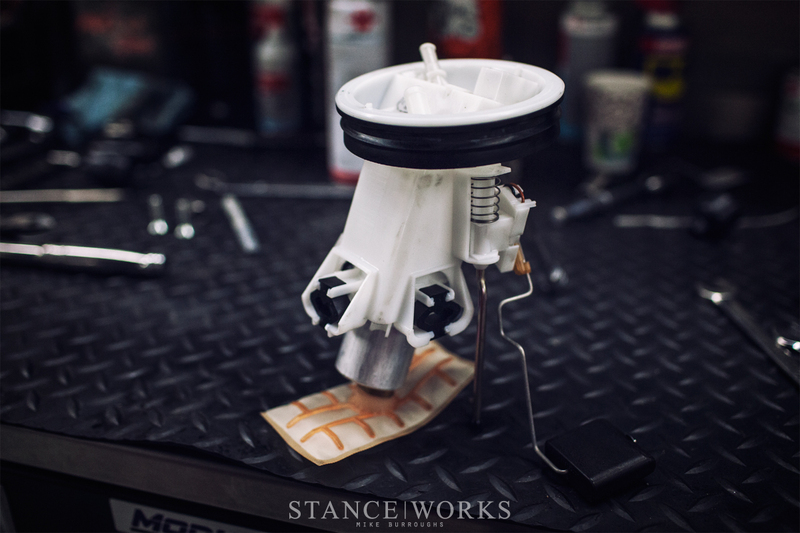 The spherical bearings removed the sloppiness of the factory arms and made a big difference in how quickly the car responded to steering inputs. The job of swapping out the lower rear control arms is a bit of an undertaking, but well worth the expense of time and effort. The end result, as you can see, is substantially different from the OEM counterpart. 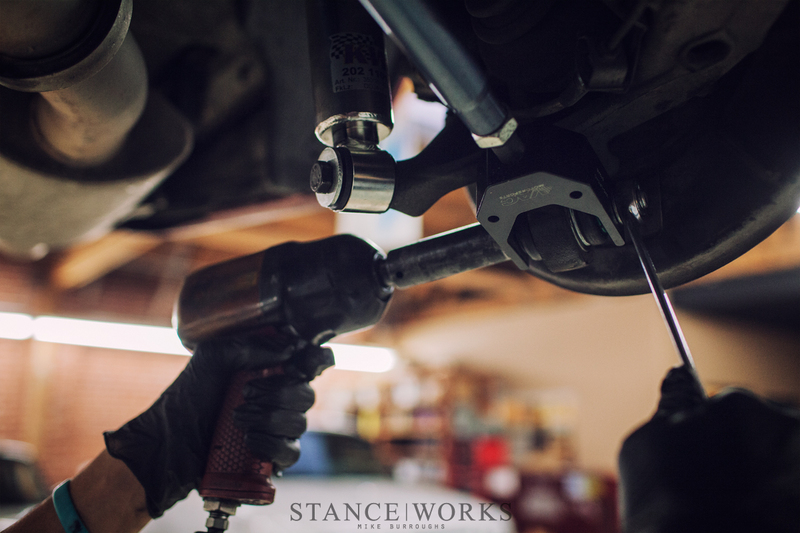 As an added benefit to the adjustability and improved response, the USA-built control arms are machined to what VAC calls a "tuned thickness." Billet Aluminum construction means they are extremely light and ridged, however, unlike steel versions offered by many, their construction allows them to minimize the damage to other suspension components in the event of a collision or impact - a costly and vital aspect many drivers learn the hard way. VAC Motorsports also sent us an E36 Fuel Starvation Kit. A common problem with e36s that see track time is fuel starvation during long right hand corners. In the words of the driver, "The factory fuel delivery system uses one fuel pump on the right side of the tank, and a siphon style pump on the left. During right-hand corners, the fuel sloshes to the left side of the tank, and the cornering forces overpower the siphoning effect, causing the power to cut out." That's neither beneficial to the engine nor lap times. VAC Motorsports' Fuel Starvation Kit replaces both factory fuel pumps with OEM counterparts that won't suffer from high lateral g-forces and a low fuel level. VAC's kit supplied us with two new OEM pumps, two new fuel pump assemblies, the proper hoses, and application-specific CNC-machined fittings. The outcome allows the E36 M3 to compete on track with as little fuel as possible - almost 80lbs of weight savings, without the need for additional in-tank baffles or modifications. The installation was straight forward - out with the old, and in with the new. The final step of preparation was to swap out for new extended studs, as well as a set of 20mm spacers for improved track width. 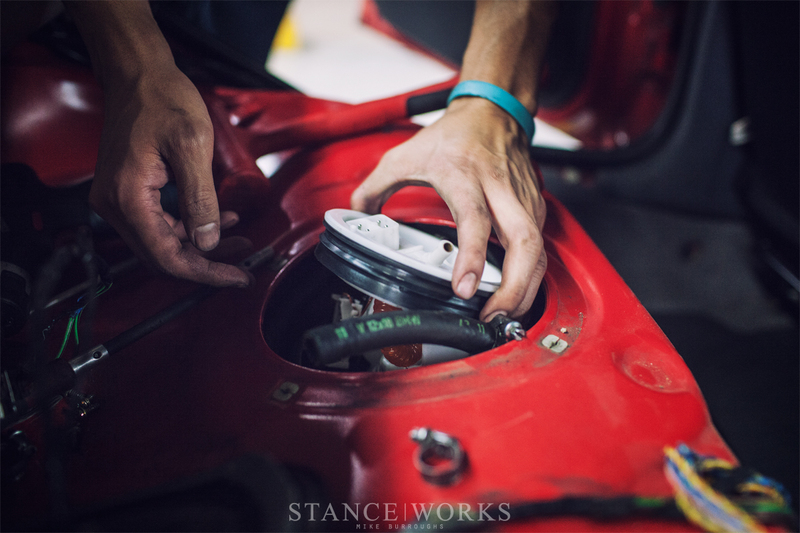 Motorsport Hardware provided the parts to do the job, and while the outcome certainly has a measurable performance gain, the aesthetic improvement helps greatly as well. The 255 Hankooks stuff the front arches completely now. 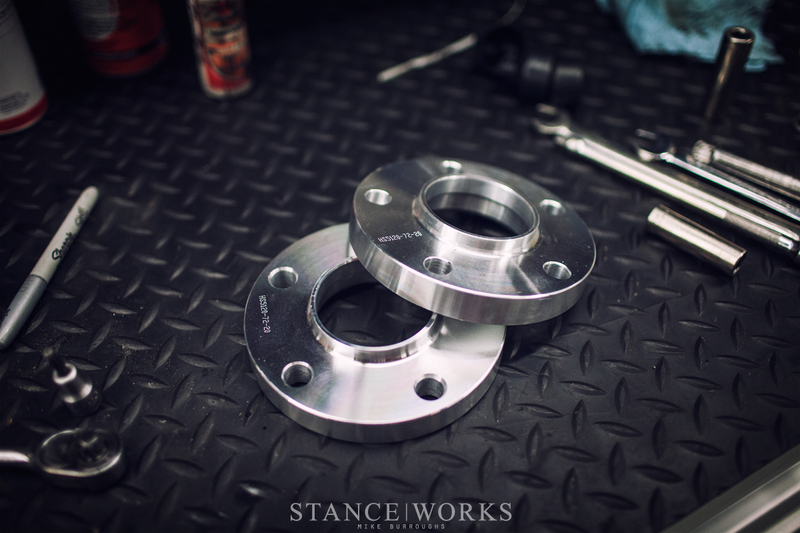 The machined aluminum spacers include a flange for hub centricity, and the whole package is capped by a set of Motorsport Hardware lugs. With the car back on the ground, and all of the needed improvements made, the car was ready and able to take on the end of the 2013 season, and better yet, the start of 2014. The car will be back under the knife before long, as we continue to make improvements, and perhaps move up to take on the Street Class. Amir said it himself - he wants to have the fastest car on street tires in North America. So we're on our way. Awesome photos & story. I’ve been following Amir on Tumblr for some time & his attitude towards developing his cars and driving them hard is inspiring.Keep it up guys! 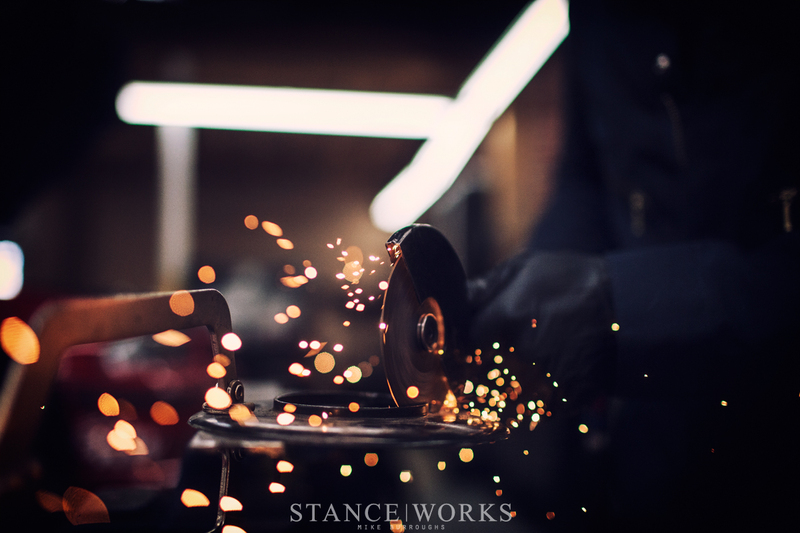 Stanceworks, а вы продаёте свои работы?